Leaf linear, to 8 cm long and 3 mm wide, sparsely hairy. Inflorescence to 15 cm high, rarely > 2-flowered. 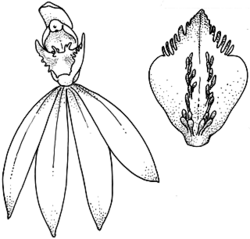 Sepals and lateral petals to 2 cm long, white with pinkish tips; dorsal sepal erect. Labellum 3-lobed, whitish pink with a yellow-orange tip; lateral lobes entire; midlobe long, margins with short, coarse, blunted teeth. Central calli in 2 rows with smooth stalks, clubbed-golfstick heads, yellow, distributed only up to the base of the midlobe. Column with inner surface well marked by a bright red blotch; upper surface with green band and bearing rounded apical wings. Distribution and occurrence: Grows in sclerophyll forest in shallow, clay-based loam; coastal districts, south from Newcastle.